Public Displays, Troupe and Demos – Why are they important? Welcome to all our new and old swing dance students & friends. What a bumper start to Classes this year and it was so wonderful to have those dance floors full and the rooms filled with laughter! Join us as we take the most perfect dance floor amongst the community of people partaking in the fun, the food, the wine and the ambience of the Currumbin Sanctuary Markets. Enveloped in the serenity of the Currumbin Wildlife Sanctuary, These markets are so very popular, packed and fun ! Full of delight..
Join Swing On In as we take the floor for nearly 2 hours of social dancing, delighting, entertaining and indulging in the dance we love the most, The Lindy Hop, to the greatest of Swing Tunes! Every Dancer welcome.. Lets Take the Floor Together and entertain and show the guests how to dance, laugh, play and have fun with Swing Dancing! 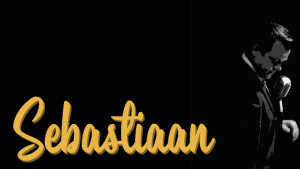 Usually 3RD FRIDAY OF EVERY MONTH – BUT February will be FRIDAY 8TH OF FEBRUARY : The Bangalow Dance Party with Swing on In and Sebastiaan..
EVERYONE WELCOME… Ready to burn some holes into those soles with your swivels, swingouts and style? Join us for our monthly social dance on the best dance floor in NSW. Great friends, community spirit, AWESOME music and great dancing. 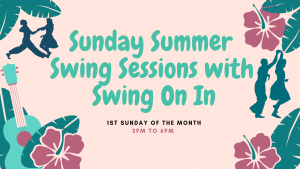 **NEW** – 1st SUNDAY of the Month now will be our Sunday Swing Sessions popping up at different places. Join us for Lazy Sundayzzz swing dancing at different cool locations to cruisy swing tunes as played by our favourite DJ’s. Dance, Chill, Eat, Drink, Repeat! Saturday 9th of March: Run for cover! The Swing On In Blitz Party is at Mo’s Desert Clubhouse! * Strictly Limited Tickets – First In will be saved! 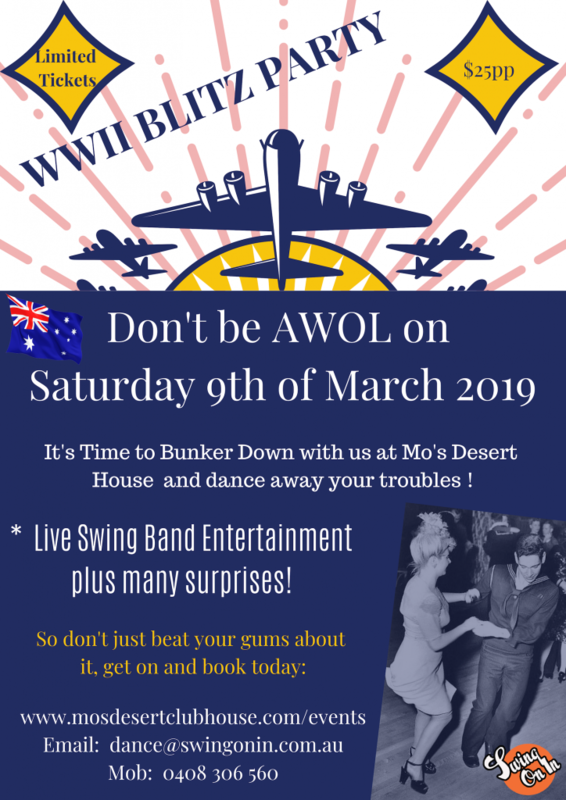 * Spam and other goodies on sale to re-stock your ration packs * Dress Code: 1940s glam, home front utility clothing and allied uniforms all welcome. There will be lots of surprises, thrills and air raids to keep you on your toes! There is limited space in the Bunker so tickets are limited to 60 pax.. First in will be saved! My name is Florine Besse and I’m 19. I started dancing Boogie Woogie at 5 in France. In 2015, I decided to compete with my partner. We became member of the French team in 2015. In 2016, we became champion of France and we finished 7th at the world championship. 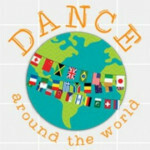 I’m still competing at an international level and I’m also a dance teacher in France. The dance form was originally inspired by American Rock ‘n’ Roll/Lindy Hop dancing of the 1950s, but gradually developed its own European style and personality. 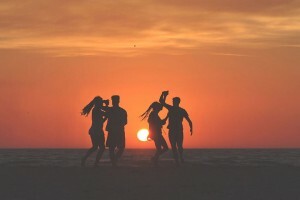 Boogie Woogie is a playful and improvised couple dance, often in medium or slightly fast tempi, with a significant footwork based on musical interpretation. Boogie Woogie of today functions as a social dance, but is sometimes recognized even more as an established competition dance. In Herräng, the social side of the dance will be emphasized and in focus..
Music: Boogie Woogie, Rhythm ‘n’ Blues and Rock ‘n’ Roll. Synonyms: Rock ‘n’ Roll, Jitterbug and Jive. Film clips: Rock Around the Clock (1955), Untamed Youth (1957), Andreas & Jessica (2007) and Pontus & Isabella (2013). Music: Boogie–woogie is a musical genre that became popular during the late 1920s, developed in African-American communities in the 1870s. It was eventually extended from piano, to piano duo and trio, guitar, big band, country and western music, and gospel. … And when I tell you to get it, I want you to Boogie Woogie! From time to time we get asked to attend events, activate spaces, showcase social dancing or perform for corporate gigs and festivals. Some are paid gig but the majority are free entertainment. When we call out for dancers it’s usually because there is an opportunity to showcase the dance we love so much and to also increase awareness around the benefits and joy of partner dancing, namely Lindy Hop and the Swing Umbrella derivations. It’s a time to shine, showcase, step up and step outside of your comfort zone. It does improve your dancing as it forces you to have a heightened awareness to your dance (Wanting to dance your best in public). This also, (of course) grows the swing dance community and our Swing On In Family. It’s a win win, so… if you haven’t put your hand up before now when I’ve called out for dancers, why not make 2019 your year to shine. As ever, Ray and I are completely thankful and feel blessed for your support. 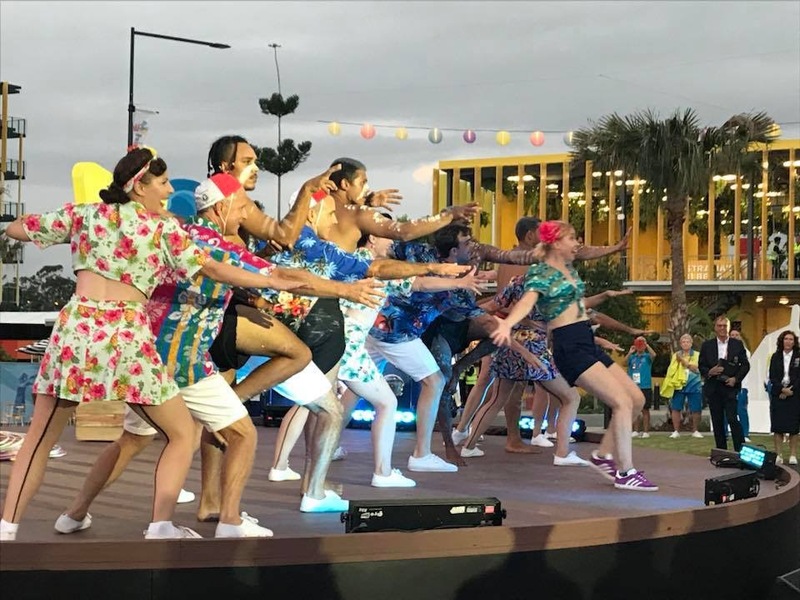 Dance Troupe, well this is a whole extra level of commitment I need from you… Just like our Game On Commonwealth Games Troupe, the new dance troupes I am forming require commitment in the learning and that means extra training and travel but its worth it. You get pushed, you push yourself, you fast track to being a better Lindy Hopper. Talk to me if you want to make this committment. 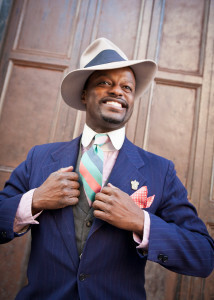 FYI.. One of my favourite all time Dapper Gents is the infallible DANDY WELLINGTON – Check out his style HERE.. not for everyone but this Chap defines Dandy. One wonderful thing about being a swing dancer is that often times when you get infected with the dance bug you often also find yourself wanting to invest a little more in your style. Shine your shoes and slick your hair, so goes the song by Fats Waller. You want to look the part. Dressing nice is one more piece in the puzzle of how to bridge the gap between old photographs and video footage — and yourself. Dancing and fashion — they really do go hand in hand. Vintage clothes are wonderful, but you can also find ways to accent your style with modern, but classic fare as well. Teaching, going to dances, pictures of yourself on Facebook… all good times to look your best. If you’re reading this, perhaps you’re interested in dressing a little better. If nothing else, looking a little more dapper in all those years of pictures is going to pay dividends for a long time to come. It might start with a new shirt, or a new tie, or dusting off an old suit that you saved exclusively for weddings and funerals (most likely from your pre-dance years). Once you put a little more effort into your look, all of the sudden more people ask you to dance. You seem somehow more trustworthy. People notice. Your confidence level goes up. It’s a self-perpetuating cycle that fuels your dancing. Now, some of these tips below might be old news to you, but they took me a little while to gather and put to use for myself. Enjoy!